This paper presents a novel approach for robot navigation in crowded urban environments where people and objects are moving simultaneously while a robot is navigating. Avoiding moving obstacles at their corresponding precise moment motivates the use of a robotic planner satisfying both dynamic and nonholonomic constraints, also referred as kynodynamic constraints. We present a proactive navigation approach with respect its environment, in the sense that the robot calculates the reaction produced by its actions and provides the minimum impact on nearby pedestrians. As a consequence, the proposed planner integrates seamlessly planning and prediction and calculates a complete motion prediction of the scene for each robot propagation. Making use of the Extended Social Force Model (ESFM) allows an enormous simplification for both the prediction model and the planning system under differential constraints. Simulations and real experiments have been carried out to demonstrate the success of the proactive kinodynamic planner. 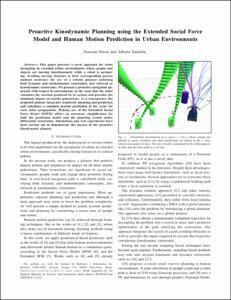 Ferrer, G., Sanfeliu, A. Proactive kinodynamic planning using the extended social force model and human motion prediction in urban environments. A: IEEE/RSJ International Conference on Intelligent Robots and Systems. "Proceedings of the 2014 IEEE/RSJ International Conference on Intelligent Robots and Systems (IROS)". Chicago: Institute of Electrical and Electronics Engineers (IEEE), 2014, p. 1730-1735.